Buffalo Grove Fire Department Quint 27 crew prepares to inspect roof fire aftermath after lightning struck a large luxury home on Stayton Lane in Long Grove. 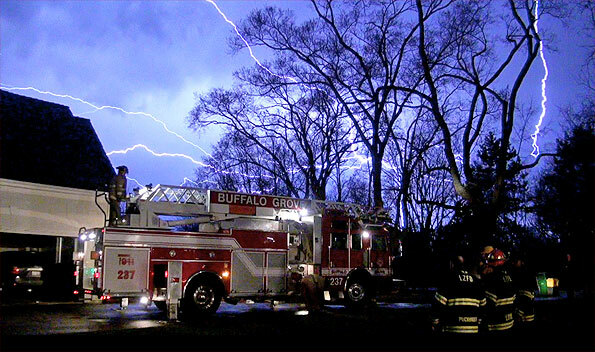 Severe lightning briefly passed through the northwest suburbs of Long Grove and Buffalo Grove about 8:30 p.m. Sunday. Lightning struck a house on Stayton Lane in Long Grove and started an attic fire. A house was also reported struck in Buffalo Grove, but no fire resulted. Firefighters inspecting the roof of a house that was struck by lightning in the 2200 block of Stayton Lane, Long Grove. The heaviest storms were later in southern suburbs where a Severe Thunderstorm Warning to effect for southern Cook County. Large hail was reported in the southwest suburbs, with hail stones as large as 1.75 inches in Channahon, 1.50 inches in Morris, 1.25 inches in Minooka. Temperatures today are expected to fall into the upper 40’s. 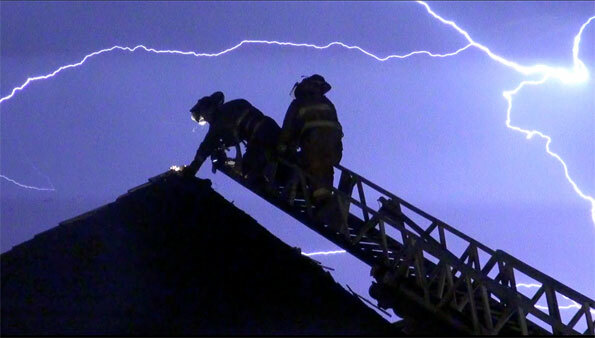 Hazardous Roof Inspection: Video of aftermath of house fire from lightning strike in Long Grove, Illinois. [LONG VERSION] Buffalo Grove Fire Department Quint 27 crew prepares to inspect roof fire aftermath after lightning struck a large luxury home on Stayton Lane in Long Grove.